Take Control of Your Holidays NOW! The holidays can be an exciting time, but they can also be a stressful time, especially if we come into this bustling time of year behind the eight ball. And, it seems to happen every year, doesn’t it? The stress, the strain, and the overwhelm. We can so easily become so stressed out about the holidays that we can’t even enjoy anything about the season. Let’s face it, we are all busy enough in the every day things of life that when something like the holidays roll around it can be enough to push us right over the edge. There are things we can do to make this time just a bit more enjoyable and a lot less stressful. These things aren’t difficult to do. It’s really just a matter of putting in the time now to save yourself the added stress later. But, what if thinking about what to do is too overwhelming? I hear you. I know just what that feels like as well. And, that’s why I started coming up with a way to do things differently a couple of years ago. And, my holidays have been transformed ever since. 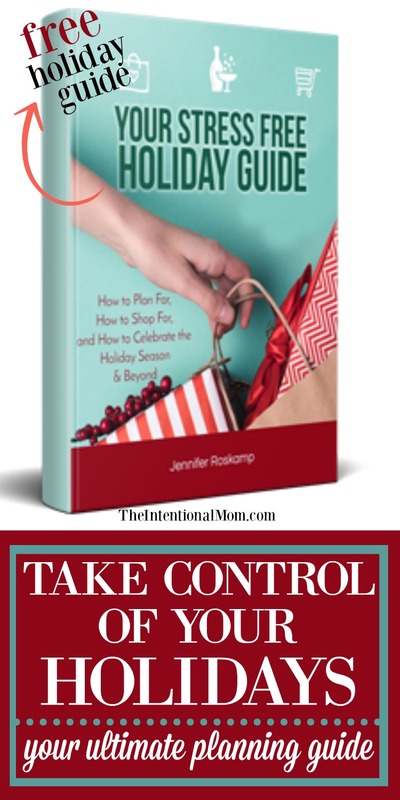 The best part is that I’m making it easy for you to have a more organized holiday season. Just enter your email below to have our holiday planning guide sent right to your inbox! It’s free! Grab Your Organized Holiday Template! Enter your email to grab our holiday organizer and some other pretty cool stuff! Success! Now check your email to grab your holiday organizer and get to the planning! While you will be taking the time and energy to do these things now, your holidays will be a breeze because of it. Ready to enjoy your holidays this year? Then here are some simple things you can do to take control of your holidays, starting right now. Are you sensing a theme here? Let’s get all those holiday cards ready to go, and that includes getting your postage ready. I’ve even had a hard time finding stamps during the holiday season at times. Just grab them now to make life a whole lot easier down the road. Have you ever had to head out to buy wrapping paper in the midst of wrapping 50 gifts? I have, and I can tell you that it’s beyond annoying. Now is the time to get enough of things like wrapping paper, tape, bows, boxes, bags, and all things holiday in your house. Do you have holiday parties to attend? Do you have what you need for your family to wear during this time of year? Not only is it expensive to get various holiday clothing at the last minute, it is also beyond stressful. It is at times like this that you won’t even be able to find what you need. Plan your holiday attire now, and get whatever you need to fill in the gaps. What can you stock up on now so you won’t have to worry about doing much grocery shopping – at least during the month of December? If you’ve got room in your cupboards, pantry, or freezer, now is the perfect time to make sure these areas are filled with things you know you will be thankful to have on hand later. Now is the perfect time to get all those little, random gifts that so easily become last minute shopping trips filled with traffic, crying kids, and parking at least a mile away from the store. Figure out what gifts you need for people like teachers and other service providers and pick those gifts up now. You can even take this up a notch by wrapping all these little presents now. Every little bit matters during the holidays, and every little thing you can do to make things easier on yourself during this hectic time will be time that is so well spent.